As the Sprinter is the Mercedes of transportation vehicles, their objective was to arouse interest in the Mercedes Sprinter and establish the van as a class of its own. What could be more persuasive than the vehicle itself? 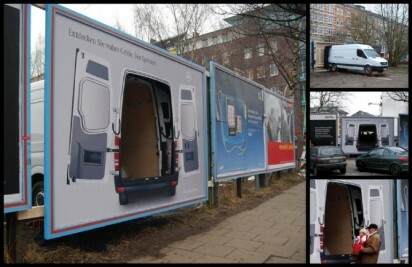 Therefore they brought the Sprinter from the Mercedes dealer directly to the target audience. Open the doors – for a surprising billboard idea. Discover “True Greatness”.